How to change the language of the user interface to English forcibly? How to create a transparent GIF/PNG? How to make a selection transparent? Where is the eraser tool? Why is a transparent color invalidated after a selected image is fixed? Can I use GraphicsGale for commercial purpose? Terminate the GraphicsGale if it's running. Double-click the gale.reg to import the registration information into your PC. 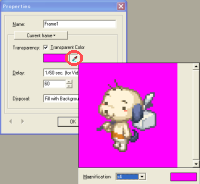 You have to specify a transparent color of each frame to create an image with transparent background. 1 Let's create a transparent GIF/PNG from this image. 2 Click Properties in File menu. 3 Check Disable Transparency of Bottom Layer on. 5 Check Transparent Color on. 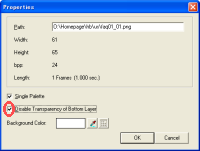 7 Click a point which has a pixel for transparent color. 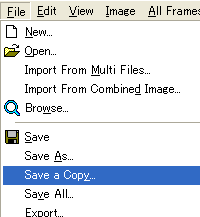 8 Click Save As or Save a Copy in File menu and save an image as GIF or PNG format. 9 For PNG, you can also save an image as a PNG with alpha channel. 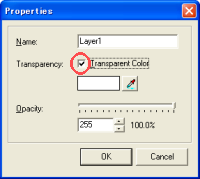 You have to specify a transparent color of current layer to make a selection transparent. 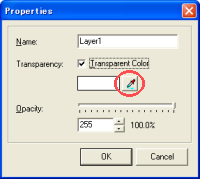 1 Click Properties button of current layer. 2 Check Transparent Color on. 4 Click a point which has a pixel for transparent color. 5 Make a selection using Rectangular Selection tool. 6 Move the selection over other image and confirm transparent color is valid. 8 Any pixels are not transparent. GraphicsGale does not have the eraser tool. All you have to do is painting a canvas with a background color. 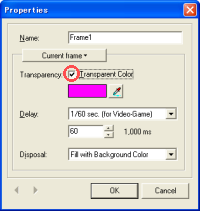 GraphicsGale treats one of colors as transparent area. 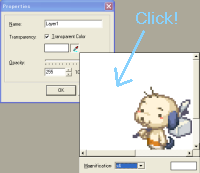 Layers and frames can have their transparent color. color is transparent and its under layers are visible. image file which supports transparency such as a GIF. If an image has an alpha-channel, a transparent color of a layer is invalidated. If you don't need an alpha-channel, invalidate an alpha-channel with any one of the following ways. Click Delete Alpha Channel in Image menu. 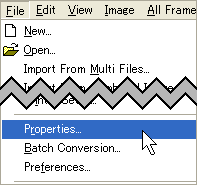 Invalidate an alpha-channel button. In this way, an alpha-channel is invalidated but is not deleted. Yes. You can use the GraphicsGale for any purpose, even commercially. Besides, it's not necessary to pay a royalty. Copyright (c) 2005-2019 HUMANBALANCE Ltd. All rights reserved.